Last weekend I had to opportunity to try a five-course vegan tasting menu with wine pairing, prepared by the incredible Chef & Somm! They’re a private chef and sommelier duo based in Toronto, who create not only delicious meals but a flawless dining experience. Their plates are truly works of art, which is an expression of their unique ideas, stories and history. No two experiences with them are the same, as they don’t have a set menu and create from scratch for every individual occasion. I learned so much about food, the origins of the wines we drank and the importance of the connection between the two. Look, I’m hesitant to upload photos of their beautiful creations next to my own recipe photos (suddenly mine don’t look as appetizing?) but I just have to show you guys. The first course was called Heritage. It was a crispy falafel ball, served with hummus, a fresh vegetable confetti and lavash! We started with a white wine for our first pairing – a 2015 Stanners Vineyards Chardonnay. The second course was my favourite (pictured above!) because of the lentils! It’s called Further East, and was a vegan scallop with a beautiful arrangement of daikon, carrots, red beets, Le Puy lentils, and a coconut curry. The pairing for this was a little different but everyone loved it! A 9.4% coffee-infused stout beer, which had in it hints of bourbon and vanilla. Course three was called Break! Seriously, how cool is this bowl? The bowl was created by Chef & Somm themselves, and inside was almond milk panna cotta, topped with green pepper and jalepeño granité. The texture of the panna cotta was thick but light, which made the jalepeño flavour known without being overpowering or too spicy. For our fourth course, we had a dish called Options v2.2 paired with a 2012 Priorat Vins i Llegendes – a red Spanish wine which was my personal favourite of the evening. This dish was unbelievable; a mushroom tarte, frisée, avocado créma, shaved cauliflower and hazelnuts. I’m a huge mushroom fan, and they were sooo flavourful and juicy! The tarte was flaky like an authentic pastry sans butter! It was a perfect dish to lead up to dessert. The final dish, fittingly titled Last, was possibly the best dessert any of us have had – I’m serious. A tapioca soup with a chocolate croquette which was coated with toasted coconut and a passion fruit sorbet. The tapioca soup was like a pudding, and the croquette was crispy on the outside but when you break it open was filled with warm, creamy chocolate. This dessert was paired with a dry red wine for contrast which worked very well. The 2015 Collepiccino from Orcia, Tuscany was smooth and flavourful and finished the evening nicely. Please don’t take my word for it! If you love ranch dressing like I do (Daiya brand- yum) and want a raw, wholefood version that you can make at home and know exactly what you’re eating, here you have it. This is so quick, no-mess (just throw everything in a food processor at once!) and blend for about 45 seconds. I am just going to list the ingredients because you now know what to do! Like I said just blend and use on a salad like the one pictured, or to dip veggies or cauliflower ‘hot wings’ in! Salad pictured: spinach, red pepper, baby tomatoes, sweet corn, sunflower seeds and paprika spiced tofu! If any of you are familiar with Aussie Bites you’ll know they are the most raved about healthy bite-sized snack found at Costco. I have never had an authentic Aussie Bite because they’re unfortunately not vegan – they contain milk and honey. My mom loves them and actually found a vegan recipe for them online which we tried and had to share. We found 2 recipes, one that more closely mimicked the ingredients in the original bites, and this one seemed to be a healthier version. They’re full of Omega 3’s and 6’s with flax seeds, chia seeds, sunflower seeds, quinoa, coconut, oats and dried fruit. They’re a great snack to serve guests especially during the holidays, topped with flaked coconut for a winterey feel. 2. In a food processor, combine oats, quinoa, coconut, sunflower seeds, flax meal and chia seeds. Put mixture into a large bowl. 3. Combine apricots, raisins and maple syrup in the food processor and blend. 4. Add the dried fruit mixture to the bowl with the oat mixture and mix with a large spoon until combined evenly. 5. Grease or line mini muffin pans. I used vegetable margarine. 6. Spoon some mix in each cup and press down well with fingers. 7. Bake for 10-12 mins. Let cool half an hour and enjoy while still a little warm, topped with some vegan butter, flaked coconut and raisins! Lately I’ve been craving Chinese cuisine, but being in Newfoundland for the holidays, options were slim in my hometown. While our two Chinese restaurants might satisfy the omnivores of Clarenville, I had to get creative. I decided to try a slightly modified version of a recipe from my cookbook titled Vegan by Jean-Christian Jury and I’m so pleased with how it turned out that I had to share! I cut the 4 serving recipe in half and made just enough for my mom and I so the following recipe will serve 2. 1. Pour half the orange juice (1/4 cup) into a bowl and stir in the 3/4 Tbsp cornstarch until dissolved. Set aside. 2. Put the remaining 1/4 cup of orange juice into a small saucepan with the brown sugar, soy sauce, ginger, garlic and mandarin zest. Bring to a low simmer and cook over medium-low heat for about 15 minutes, until reduced to half. 3. Stir in the cornstarch and OJ mixture until completely blended. Remove the pan from the stove and set aside. 4. Cube tofu and roll in remaining 1/6 cup of cornstarch to coat. 5. Heat the Tbsp of oil over medium-high heat and add tofu cubes for 5-6 minutes per side, until crispy. Place tofu on a plate lined with paper towel. 6. Boil water and place broccoli in a steamer basket for about 20 minutes, or to desired tenderness. 7. Return everything to skillet and toss with sauce. 8. Serve over rice, topped with sesame seeds and chili flakes. Looking for the perfect holiday recipe to bring to a potluck, family gathering or just to have at home? LOOK NO FURTHER! Trust me, this recipe deserves a grand introduction. I’ve seen versions of this recipe circulating the internet and I’ve meant to try it, but I didn’t expect it to be this tasty! This is my personalized recipe, and I encourage you to tweak it to suit you – for example, using white potatoes if Shepard’s pie is a childhood comfort food for you and you want it to be as similar as possible, or leaving out the rice and using all lentils and veggies for the filling! I also used flax oil because it’s high in Omega-6 but I’m sure any oil will do. Fun fact! Most people discard the leaves of their celery, but they are a very potent source of calcium, vitamin E and iodine as well as many other micro nutrients. If you like celery, they’re a great garnish and go well with this dish. 1. Bring 2 pots of water to boil. One is for the sweet potatoes, which will have just enough water to fully cover the potatoes. The second is for the rice, and if you’re using 1/2 cup rice use 1 cup of water. Add a pinch of salt to each pot to make it boil faster. Make sure the pot used for rice is big enough to fit the lentils and veggies as well. 2. Preheat oven to 425 F and spread a tablespoon of the oil onto an oven-safe baking dish such as the one pictured. 3. Add the rice and the potatoes to their designated pots. Add the cube of vegetable stock to the rice. Each should take around 20 minutes. You know the potatoes are ready when they are soft. The rice will absorb almost all of the water, and will be soft. 4. When almost all of the water is absorbed by the rice, add the frozen mixed vegetables, can of lentils and spinach to the rice pot. If the water is gone before the vegetables are warmed, add some more to prevent the rice from sticking. Stir continually. 5. Drain the sweet potatoes well. Mash them in a separate bowl with another tablespoon of flax oil and another dash of sea salt. 6. When the lentil/rice/vegetable mixture is warm throughout, spread it on the bottom of the baking dish. Next, spread the sweet potatoes on top of that. 7. Transfer the dish to the oven, and bake for about 25 minutes, until the sweet potatoes begin to brown and get slightly crisp around the edges. 8. Garnish with dried tarragon and celery leaves! OKAY… it’s not summer anymore. I was brutally reminded of this on my way to a casting this brisk morning, when I nearly got frostbitten. Nonetheless, there are some good things about autumn in Canada. Hot drinks, fuzzy blankets, cozy sweatpants and movie nights in. We can also enjoy hearty, warm dinners like this one! Winter doesn’t have to mean Uber Eats knocking at your door with greasy takeout every night – (summer bodies are made in the winter!) so get your steamer and your veggies and try this delicious, filling and healthy recipe. Start by washing your veggies, peeling the sweet potato and chopping it into bite sized chunks for steaming. Add sweet potatoes and kale to steamer side by side (not mixed) and steam for 10 minutes or until sweet potatoes are tender and soft. Remove kale and place in a bowl. Add oil and salt/pepper, massage the mixture so the kale absorbs the oil and becomes tender. Add kale to plate, topped with chickpeas and sweet potato. Chop beat into small pieces and all that as well. Finally, squeeze lemon wedge over the salad and eat! With Fall right around the corner (it may not feel like it yet- especially here in Toronto!) it can be nice to have some warm, hearty comfort food recipes. Although for most of us the recipes our parents made for us when we were younger were probably not vegan, that doesn’t mean we can’t enjoy them with some slight modifications. It also doesn’t mean that their plant-based versions won’t be protein packed! The tempeh alone in this dish gives 17g per small single serving. 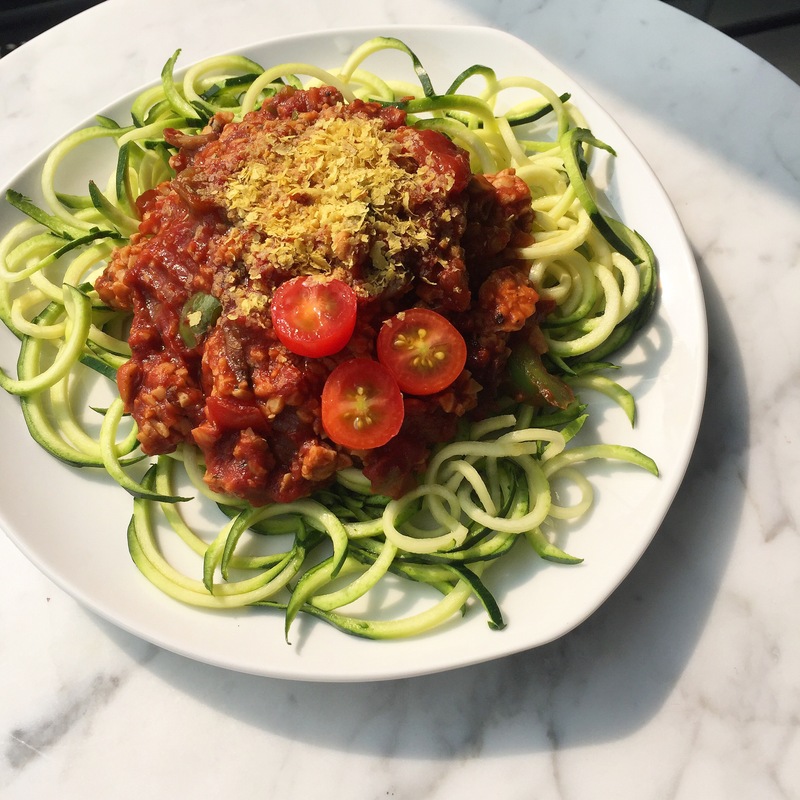 I put my bolognese on top of some zoodles and topped it with nutritional yeast, but feel free to use whichever base you’d like- regular spaghetti, chickpea pasta for extra protein, brown rice noodles or just have it on it’s own. I cook for myself, so this recipe is single serving. Just multiply everything by the number of people you are serving. 2. Add veggies/garlic and let simmer for about 5 minutes. 3. Crumble tempeh and add to the mixture. Let simmer for 5 minutes more with veggies. 4. Add about 4-5 shakes of salt (around a teaspoon) tomato sauce and 1/4 cup of water. Mix everything together in the pan. 5. Place spiralised zucchini on a plate and once the bolognese is thick and water has evaporated, top the zoodles with it. 6. Optional: top with nutritional yeast and some fresh ground pepper or basil. This may be the world’s greatest snack. It’s so healthy, giving a boost of sustainable all natural energy. It’s also really quick and easy because there’s just 5 ingredients and absolutely no processing or baking is required. It’s also fun to make because you get to use your hands! To top it off, if you have extra oat and seed mix after all the dates have been used, it makes an excellent over-night bircher muesli. Yeah. Disclaimer: I really have to give a shout-out to Deliciously Ella for the inspiration. Although I didn’t use her recipe, I was inspired by her Coconut and Oat Energy Balls. She has tons of flavours, but I noticed that this one didn’t contain any nuts. Instead, she used pumpkin and sunflower seeds for protein and healthy fats! Seeds are rarely an allergen, so this is a great recipe to bring to a party or potluck that most everyone can safely eat. You want to have approximately equal parts oat and seed mixture to dates. Chop your dates with a large knife into small pieces- quarters or fifths work. Mix together the rest of the ingredients (oats, coconut, seeds). Place dates in a bowl and add about half of your oat mix. With a large spoon or your hands, mix the oats in with the dates. This can be a bit of a workout if I’m honest. Once the first half is done, slowly mix in the rest until it’s one big sticky concoction! If you cannot get all of the oats in, no worries! As I mentioned above, it makes a great bircher muesli. With your hands, form small balls about an inch or 2 in diameter. You should have about 12. Snacks for a week! Ever since I began raw til’ 4 I’ve felt so much better avoiding starchy carbs, even after 5. Things like bread, noodles, and in this case rice, just haven’t appealed to me as much. I discovered cauliflower rice, which is basically just cauliflower shredded. On its own it is the furthest thing from rice, but when it is mixed with other flavours, especially dominant ones, and cooked it’s quite similar! I was impressed. This recipe is super easy- just 5 ingredients required! 1.First, saute the cauliflower rice in a pan. 2. Chop tomato into small chunks. 3. In a separate pan, add the rest of the ingredients. It will appear runny at first but will thicken as the coconut milk heats up and the veggies absorb it. 4. Simmer for about 5 minutes, until caulirice is soft and chickpea mix is thick. 5. Place into a bowl and serve hot. With such nice weather here in London I’ve been craving light, fresh salads for dinner more so than cooked meals. The sweetness of the apples and raisins in this salad make it even more summery and delicious! Although it may not appear to be a filling meal, there’s about half an avocado in there which makes it quite satisfying, along with the walnuts. I used green apples to make it a little tart, but if you prefer to keep it sweet I recommend using red and possibly exchanging the celery for cucumber. If you’re wondering where the protein is, other than the nuts of course, a vegan take on a “chicken” Waldorf salad could be grilled tofu, but I wanted to keep this meal completely raw. Scoop the avocado half from its skin and mash it in a small bowl. Add to it the lemon juice. Chop lettuce and throw in a large salad bowl. Mix avocado through the lettuce- it will be chunky but that’s okay. Add chopped green apple (leave a few as slices for garnish!) and celery. Throw walnuts and raisins on top. Garnish with some apple slices. Voila! Enjoy in your back yard barefoot on the garden swing. Next to a pool works too.